“Remember Tobiah and Sanballat, O my God, according to these things that they did, and also the prophetess Noadiah and the rest of the prophets who wanted to make me afraid” (Neh. 6:14). Our only source of information about the prophetess Noadiah is the book of Nehemiah. The book is the memoir of a governor appointed by the Persian king after the exile of the Israelite people in the 5th century B.C.E. He was not a prophet, priest or king and therefore had no mandate from the Jewish people or God. Artaxerxes I awarded him the task of rebuilding the walls of Jerusalem and continuing the restoration of the Temple. This was a time of social crisis with a great deal of unrest and upheaval as a result of famine and a heavy debt load. There appeared to be a great deal of opposition to Nehemiah’s wall-rebuilding project. “Even before Nehemiah narrates his own entrance into Jerusalem, he informs his reader of the local and regional opposition sparked by the news of his impending arrival in the city…Nehemiah’s description of the construction and completion of the wall in chapters ii, iv and vi is punctuated by a succession of reports of the opposition which he and the builders encountered in the course of the project” (Shepherd, pp.232-3). Carroll concludes that as the Persian governor of the province and therefore representative of an imperial government, the local people resisted Nehemiah and whatever he imposed upon them, including a new wall (Carroll, p.95). In addition, Nehemiah was accused of fomenting rebellion and preparing to become the king of Judah (Shepherd, pp.239-40). Beginning with his predecessor Ezra, Nehemiah forced men to divorce and send away their foreign wives and their children. The purpose of this ban on exogamy was to maintain ethnic purity at any cost, even if violent means were required. “Where Ezra beat himself and pulled out his own hair (Ezra 9:3), Nehemiah beat the returnees and pulled out their hair as he cursed them and forced them to abandon their wives and their children (Neh 13:25)” (Gafney, p.112). Carroll notes that there are many instances of hostility toward women in Ezra and Nehemiah (p.93). It seems likely that Noadiah championed the welfare of women and therefore rejected Ezra and Nehemiah’s harsh policies toward foreign wives and their children. 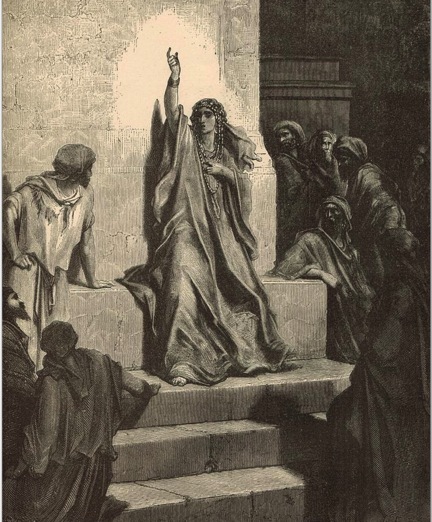 “Given the behavior of Ezra and Nehemiah in the biblical text, it would hardly be surprising if a considerable number of women in their Jerusalem were not in open opposition to either leader” (Carroll, p.95). Since Noadiah is mentioned by name by Nehemiah when he mentions his opponents, it seems she took a leading role in the opposition to his building project. This “is probably a measure of her importance and political power” (Brenner, Israelite, p.61). It appears that she was the head of the Jerusalem-based prophetic guild and she had the power to appoint kings just as Elisha before her (Fischer). As a way to circumvent her power Nehemiah set up his own prophets to anoint him as king (Neh. 6:7) and declared that Noadiah was a false prophet. Not only was Noadiah a prominent leader in the community, but all the other prophets in Jerusalem appeared to agree with her. Noadiah’s “opposition was formidable enough to send Nehemiah to appeal to YHWH, and…Nehemiah was terrified of what she could or would do if YHWH did not intervene… I suggest that she was opposed to his policies, which included breaking apart families and leaving women and their children as persons without status or identity, with neither shelter or sustenance. This may appear to be at odds with the immediate context of the dispute, the rebuilding of the walls. However, I understand the rebuilding project to be about literal and figurative separation of the reconstituted Judeans from the peoples around them [including their foreign wives and children]. The wall cannot be for defensive purposes, since Yehud (the province formed by the postexilic remains of the kingdom of Judah) is a vassal state and Persia is sponsoring the rebuilding” (Gafney, pp.111-2). The wall physically represented the compulsory exclusion of the people of non-Israelite descent. Nehemiah implied that Noadiah was a false prophet and said that, along with the other prophets, she intimidated him. Some have argued that the Hebrew root of the word for fear can be used to express a sense of respect but in this context, there is no sign of respect for Noadiah (Shepherd, p.238). Naturally Nehemiah’s memoirs present his own point of view and therefore obliterate his opponents’ positions. Despite the fact that all the prophets in Jerusalem supported Noadiah, post-biblical commentators have neglected her because any defense she might have launched has not been preserved. “Prophets are only ‘true’ or ‘false’ from some perspective or other…Thus in Ezra-Nehemiah, Haggai and Zechariah are good and acceptable prophets because they support the project of Temple building which reflects the ideological values of the producers of Ezra-Nehemiah. Shemaiah and Noadiah are condemned because they are associated with the people who oppose Nehemiah’s building enterprise” (Carroll, p.91). Given Noadiah’s probable role as the leader of the guild of prophets whose numbers ranged between 100 and 450, her association with other community leaders, the support of some of the priestly families and the local residents (Gafney, p.113), it appears that Nehemiah stacked the cards against her by making sure he had the last word. Although we do not know Noadiah’s prophecies and teachings, we can right an injustice by at least noticing her presence. Perhaps we can even imagine her voice and her words by inviting her into our midst and remembering her as a distinguished Biblical prophetess.